with openGL support if that is present. Requires a C++ compiler and sdl1.2 development libraries (and opengl). may be added, and will be listed in this section if so. - Save 40l player data state, or allow a custom setting to be saved and used by default. - Fix some problems that occur when changing window focus and reverting back to heboris. - Allow different key configurations for the menu vs. the gameplay. - Setup a cmake build system. - Any other minor bugs/errors I can find. CONFIG.SAV file from config/data and restarting. You can select 8 different rotation rules. 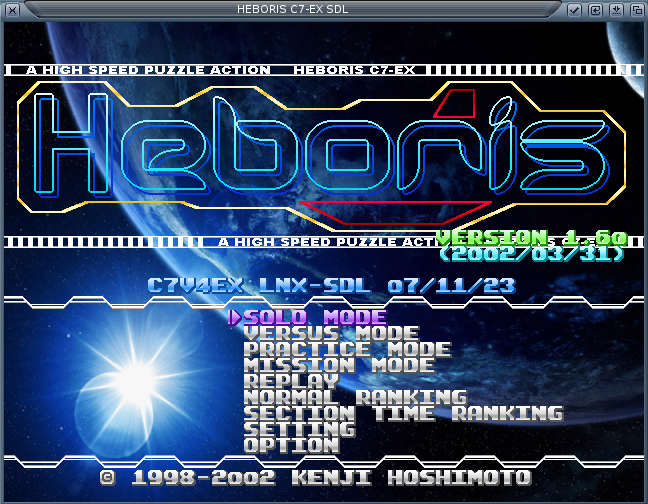 HEBORIS : TGM1 and TGM2 style. Same as original heboris rotation. TI-ARS : TGM3 style. T and I piece have special ground kick(It works only once!). TI-WORLD : SRS, you can move 10 times, or rotate 8 times. Fast drop is slower than TI-WORLD. ACE-ARS : TGM-ACE style rotation rule. Really strange! Fast drop is slower than TI-ARS. ACE-ARS2 : Same as ACE-ARS, except soft drop and hard drop. DS-WORLD : SRS, you can rotate or move infinity! SRS-X : Original rotation rule based on SRS. But you can use Zangi-moves! You can move 24 times, or rotate 12 times. And C-botton is "180 degree rotarion" with original wall kicks. D.R.S : If you have ever played DTET,let's use this! Added T and I ground kick(only once!) to it. You can play these extra modes. Blocks are always 2 times bigger. Select BEGINNER mode and press Hold botton once. Default of BEGINNER mode is fireworks trial. But this is score trial. support Item block will appear. Select MASTER , 20G, or DEVIL mode and press Hold botton once (twice in DEVIL mode). Item blocks apeear,but attack items affects yourself. Select MASTER or 20G mode and press Hold botton twice. Select TOMOYO mode and press right arrow key once(twice). Other stages from other game(TGM-ACE). Always, place of platinum blocks are randomized. Select TOMOYO mode and press left arrow key once. Select ACE mode and press right arrow key once. It's faster than ACE mode. Select ACE mode and press right arrow key twice. Select ACE mode and press right arrow key three times. If DEVIL-DOOM is too fast for you, let's try. Select DEVIL mode and press Right arrow once. Select DEVIL mode and press Hold botton once. Only one next display and no Hold! (NOTE:You can use DEVIL- and DEATH+ together. Select SIMPLE mode (40LINES or ULTRA2min) and press Hold botton once. Play 40LINES or ULTRA2min with ALL rotation rules. Top-out does not become gameover,but penalty will be added. graphics, bgm, sound effects, and backgrounds from there.